Natalie delights you with her energy and makes you work hard in this fun, full body EXO Chair class. 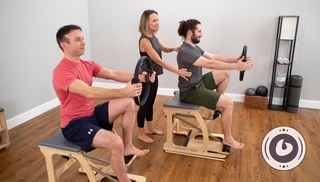 Get a great workout and execute creative combinations using the split pedal, all while being coached with dynamic cues. Enjoy! Join us in this dynamic EXO Chair workout! Want spine mobility, core, lower body and a whole body integrated experience? This video is for you. ﻿PLUS, add resistance with the Slastix to change the feedback through the body and an extra challenge! Learn how to use the Functional Resistance Kit on your chair, to work your body from top to toe! Variations for different fitness levels are included for each exercise, plus an introduction to the Chair.